There is a God...so, you never know. 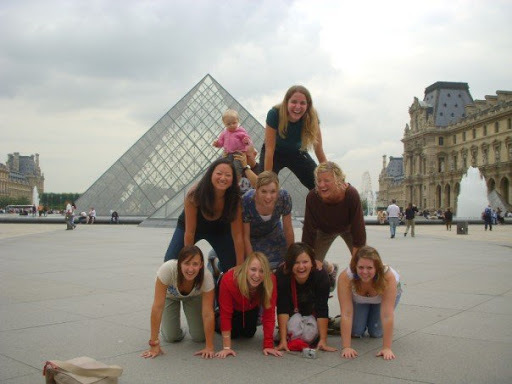 You could do a human pyramid at the Louvre Museum in Paris with a few friends...and your baby...You just never know. Here is what brings this post about. Tonight at dinner Jady and I were talking about how we are 30 (I'm 29 but its the same thing) and we are in the middle of this great adventure where anything could happen at any moment. After dinner we were watching this video on Martin Smith & Delirious. They were this little nobody band who used to just play in schools. Then they got an invited to play at a prayer conference & God launched them into being a massively influential band. Fast forward a few hours...I was watching a Hillsong promo for a conference (shocker) and one of the guys said " I don't think I can make it, but there is a God so, you never know." Hmm...I thought. So very true. We really never know. Anything can happen with God. At any time. I loved living in Seattle and the thought of leaving Mosaic had me crying for a year and a half. God had amazing things for me there and there are still amazing things continuing to happen. But now I am here. In a field where God can plant anything. Although the season of transition was so painful, God had things for me in a new season. In Seattle, I was too busy to write. Now I have time & I'm really enjoying it...and people read it...who knew. Other things are starting to emerge that didn't have room before. There is a God, so I just never know. If you ached on Mother's Day because you long for children. There is a God...so, you never know. You have a heart for reforming education, but you have taught the same first grade class for 20 years now. Maybe one of the kids you invested in will go on to become the Secretary of Education . There is a God, so you never know. You lost your job, and can't seem to get another one. Could be that God wants to take you in a completely new direction. There is a whole new arena you never thought you could enter with your life, but He is about to invite you in. You never know. You follow God to a remote place. Nothing seems to be there. But He is about to plant a garden in a desert. And He wanted you to have a front row seat. What seemed like exile is now honor. There is a God, so you never know. Keep hope fresh. Keep dreams alive. And keep your soul full. There is a God...so, you never know...He may surprise you. God doesn't do cover songs.